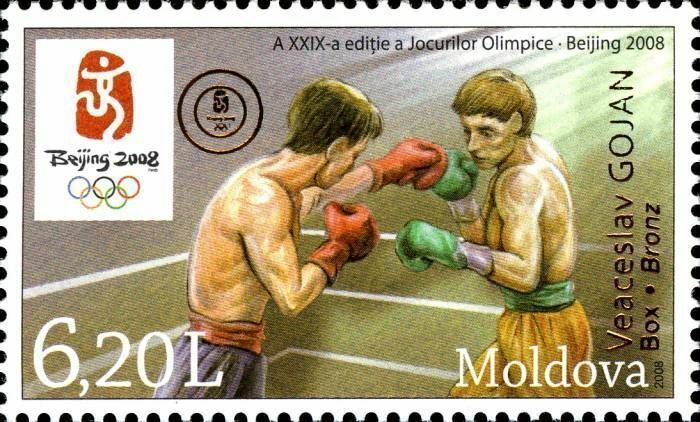 On 21 November 2008, the Post Office of Moldova (Poșta Moldovei) issued a postage stamp with the title Medal Winner at the Olympic Games, Beijing (Overprint on № 609). The issue comprises one stamp, with an associated cancellation (postmark) and first day cover (FDC). The designer was Vitaliu Pogolşa. The printing was performed by Tipografia Centrală, Chişinău. Veaceslav Gojan (born May 18, 1983) is an Moldovan amateur boxer who won Bantamweight bronze at the 2008 Olympics. He comes from the village of Grimăncăuţi, district of Briceni (north of Moldova) and is a member of the Central Sport Club Dinamo in Chişinău. His coach is Petru Caduc. Read more.. This article uses material from the Wikipedia article 'Veaceslav_Gojan', which is released under the Creative Commons Attribution-Share-Alike License 3.0.